Asda is being forced to stop calling itself "officially Britain's lowest priced supermarket" after a complaint from rival Tesco. Tesco had objected to the Advertising Standards Authority (ASA) about the claim, made in a number of Asda press adverts and a TV commercial. After an investigation, the ASA upheld Tesco's complaints and told Asda not to repeat its low price assertion. Leeds-based Asda made the claim following a price survey by The Grocer. The supermarket industry magazine's Grocer 33 Survey compared the price of 33 products across eight retailers on a weekly basis for a year. In June 2004 The Grocer named Asda winner of its annual "cheapest basket" award for the seventh year in succession, after which Asda began the advertisements in question. Tesco complained to the ASA because it said The Grocer survey was limited and unrepresentative, as it did not look at enough product lines. 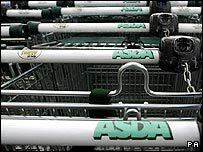 The UK's largest supermarket group also objected to Asda's use of the word "official", as it said this wrongly suggested that the survey was Government or industry body-based. Tesco was further aggrieved by Asda's additional use of the phrase "you win every day", saying this wrongly implied that Asda was cheaper than it main competitors for all items at all times. The ASA found for Tesco, further adding that The Grocer survey did not include low-cost supermarkets. Asda - the UK's second largest supermarket group with headquarters in Leeds - has since won the Grocer 33 survey this year. It said its current advertising would be unaffected by the industry watchdog's decision. Asda marketing director Chris Pilling added that Tesco's complaint was a "complete waste of time". "We promise we'll never again claim to be the cheapest supermarket for seven years in a row, that's because we've now won the Grocer title for eight years on the trot," said Mr Pilling. Julian Hunt, editor of The Grocer, said the magazine stood by its survey. "We believe our shopping survey is based on robust methodology, is independent and is well respected," he said. Tesco said it was "delighted" with the ASA's decision.